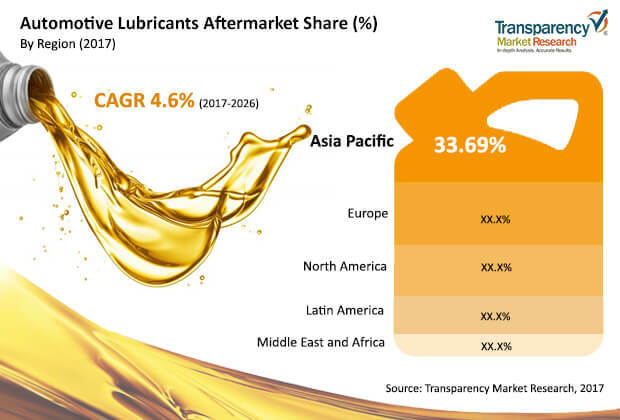 The global automotive lubricants aftermarket was valued around US$ 82 Bn in 2016 and is anticipated to expand at a CAGR of 4% from 2018 to 2026, according to a new report by Transparency Market Research (TMR) titled ‘Automotive Lubricants Aftermarket - Global Industry Analysis, Size, Share, Growth, Trends, and Forecast, 2017–2026.’ Lubricant is a substance that is made up of base fluids and additives. A typical lubricant composition consist of 80% to 90% base oil and the rest is additives, However, this composition is subject to change as per the application. Lubricants are used for their ability to increase the operating lifespan of mechanical parts. They are used to minimize the friction between parts in contact with each other, thus eliminating wear and prolonging lifespan by Robust economies of countries such as China, India, Brazil, and Middle East have increased disposable income of the population, resulting in higher car ownership.This, in turn, has been augmenting the consumption of automotive lubricants in recent times. Rise in demand for lightweight and high performance vehicles mandates the use of high-quality lubricants. This is a key factor propelling the consumption of automotive lubricants. Increase in demand for vehicles due to economic prosperity economy and increasing purchase power have resulted in higher car ownership. The global motorization rate i.e. vehicle ownership per 1000 inhabitants increased to 182 per thousand inhabitants in 2015 as against 178 in the previous year. Europe and North America are mature regions of the market for aftermarket automotive lubricants, with car ownership rates as high as 580 and 680 per thousand inhabitants in 2015. Low penetration of automotive vehicles, particularly in regions such as Latin America, Asia, and Middle East & Africa, presents significant opportunities for the automotive lubricants aftermarket. For instance, the motorization rate in Asia, Africa, and Latin America stood at 105, 42, and 176 per thousand inhabitants, respectively, in 2015. Along with this, accelerating economy, rapid urbanization, and increasing per capita income may compel individuals to own a vehicle. This, in turn, is expected to create an incremental market opportunity for the automotive lubricants aftermarket in the near future. Lubricant oil chemistry and engine technology have evolved tremendously in recent years, resulting in improved engine oil drain interval. During the 1950s, a truck engine oil change would have to be performed for every 500 miles. But those days are gone. Currently, it is possible to achieve an oil drain interval as high as 50,000 miles in heavy duty vehicles. Factors that have resulted in improved oil drain interval include cleaner fuels, higher quality lubricants, more dependable engines, and improved filter technology. The standard oil drain interval is 25,000 miles. However, various factors such as engine design, vehicle age, condition, driving patterns, and oil properties are known to affect the engine oil drain interval. Oil service intervals are pre-determined by engine manufacturers and are designed to provide optimum engine protection within intervals. Majority of the vehicle owner tend to follow these instructions, However, there has been growing trend of lengthening the oil service intervals beyond the OEM specifications. Extended oil drain intervals help fleet owners to reduce their operating and maintenance costs, mainly by keeping cars and trucks on road for longer. Improvement in engine oil drain interval is expected to decrease consumption of engine oils in commercial vehicles. This is anticipated to eventually decrease the consumption of lubricants during the forecast period and may dampen demand for aftermarket automotive lubricants. A lubricant is a package consisting of base oil and certain additives to improve performance. Although, mineral-based automotive lubricants have been dominating the market due to their reasonable prices, there has been a shift toward the usage of synthetic and semi-synthetic based lubricants. As modern light weight vehicle engines are put under enormous stress, automakers worldwide are shifting toward less viscosity lubricant grades, which require synthetic base oils to meet mandated fuel economy standards and emission requirements. Demand for synthetic lubricants is high in North America and Western Europe. Europe is a prominent consumer of synthetic and semi-synthetic automotive lubricants in the aftermarket. In 2015, fully synthetic lubricants accounted for more than 10% of the market in Western Europe, with semi-synthetics accounting for market share of around 25%. Automakers across the globe are emphasizing on engine downsizing, which requires lower viscosity grade oils. This is likely to present further opportunities for synthetic lubricants over the forecast period. In terms of type, the automotive lubricants aftermarket can be divided into engine oil, gear oil, transmission fluid, and others (including coolants, greases, and brake oil). In terms of volume, the engine oil segment dominated the automotive lubricants aftermarket, capturing more than half of the market share in 2017. This is primarily attributed to the fact that capacity of engine for lubricants is higher than that for gearboxes or axle cylinders. Engine oils require frequent draining and replacement than gear oil and transmission fluid, since they protect the engine from friction wear and tear. Hence, requirement of engine oils is higher than that of gear oil and transmission fluid. In terms of application, the global passenger vehicle count stood at 947,080 thousand units in 2017 against the commercial vehicle count of 335,190 thousand unit for the same year. Hence, the overall automotive lubricants aftermarket, in terms of consumption, is dominated by the passenger cars segment due to the sheer number of existing units. In terms of revenue and volume, Asia Pacific dominated the global automotive lubricants aftermarket in 2017, constituting more than 30% market share. The global vehicle fleet count, including passenger cars and commercial vehicles, in Asia Pacific stood at 384,318 thousand units in 2015 against 359,927 thousand unit for the previous year. The vehicle fleet in operation in Asia Pacific is nearly one third of the global fleet. In order to operate and maintain this humongous vehicle fleet, it has to be fed with lubricants at frequent time intervals. Also, some of the countries in the region such as China and India have witnessed a tremendous growth of 15.6% and 9.9% in its passenger vehicle fleet count, which is indicative of promising expansion of the automotive lubricants aftermarket in the region. The global automotive lubricants aftermarket is a highly organized market, with the top players accounting for majority of the market share. Key players in the Automotive Lubricants Aftermarket are Royal Dutch Shell plc, ExxonMobil Corporation, BP p.l.c., Chevron Corporation, Total S.A., Sinopec Corporation, Fuchs Lubricants Co., LUKOIL Oil Company, Valvoline, Phillips 66, Bharat Petroleum Corporation Limited, JX Nippon Oil & Energy Corporation, Repsol S.A., Petrobras, Petronas, and Indian Oil Corporation Limited. With plummeting crude oil reserves, the global lubricant market is facing a tight supply of raw materials. In order to overcome this, major oil companies are shifting their focus on the development of new refining techniques and sources. This trend has resulted in establishment of new refining technologies that are patented by established players to produce high performance automotive lubricating oil.